Before I read Deliverance, before I saw the movie, I heard James Dickey read from his novel one evening at the University of South Carolina’s Longstreet Theater, a fitting place. Augustus Baldwin Longstreet, a Georgia boy like me, gave his name to the theatre. What better place for Dickey, A Georgian, to read his story about Georgians, fictional though they be. The evening came about as an accident. A friend with a literary bent was giving me a lift to the bus station, later an art deco bank and later, nothing. I was to catch an all-night local to Charleston, West Virginia. “Dickey’s reading from Deliverance at the Longstreet Theater,” he said. “Want to go?” It was 1974, two years after the movie came out. I had time to kill. We walked into the dark theater—standing room only—where the north Georgian’s voice floated over the vast hall. Dickey was deep into his story, where the Atlantans discover Drew’s body downstream. Bobby and Ed are about to sink Drew with stones, knowing the rising impoundment will forever cover him and the truth as well. The audience sat still as stones beneath the Chattooga. Women dabbed tissues to their eyes. That night, kept awake by a busload of singing Marines, somewhere near Hillsville, Virginia, a river ran through my head and I thought about what I had witnessed. It was an evening I would never forget. In the minds of many, Deliverance cemented Dickey’s reputation as a popular novelist—not the poet he truly was. To me, a naïve twenty-five year old, he was a writer, pure and simple. And that was enough. Being a Georgian like him and harboring writing dreams myself, I knew I had to meet him someday. But would I? Seeing Dickey at the Longstreet Theater was a turning point in my life, only I didn’t grasp it at the time. (I grasped little back then.) Nor did I know I would abandon a much-desired writer’s position one day, a defiant act that would, in fact, lead me to the poet. I began teaching at Columbia College in January 1974. Not much older than my students, six months turned into four eventful years. Teaching at a woman’s college carries beautiful benefits but a career for me it wasn’t. I had an itch to write. In 1978, I applied for a position as a scriptwriter for natural history films, a position I wanted in the worst way. To get the job, I had to survive an interview with a tough Georgian. I was nervous, dying inside. Despite working for bureaucrats with the vision of a mole, he turned a cheap flyer into South Carolina Wildlife, the country’s best conservation magazine of its day. He and Billy DuRant, the man I’d work with, interviewed me over lunch in washed out West Columbia at a diner with a bewitching name—the Sunset Grill. When you are young, job interviews feel like a walk to the gallows. The food was supposed to be very good—that’s why we went there—but I don’t remember anything about the interview except the very last question, which I thought was a trap, set by my days at the woman’s college, and about to spring. During six years in the film production unit, I wrote a few features for the magazine. Then I became the magazine’s managing editor. Here, I wrote my first speech for a governor, Richard W. Riley. Here, I began to make contacts with the community of people needing the services of a writer. Altogether, I worked at South Carolina Wildlife nine years, developing the skills of a freelancer on the sly. I learned a lot about writing and even more about people, and I learned to dislike authority. And when I could learn no more, I left. One steamy afternoon, thunderclouds gathering in more ways than one, a book contract in hand, I tallied my freelance earnings on a yellow legal pad. August 19, 1987, at 3:30 in the afternoon, I quit my job on the spot. Giving no notice, I walked out to pursue freelance writing, a world of odd assignments, books, and kooks—disappointment and exhilaration—where James Dickey and I would meet two years down the road. I agreed with him 100 percent. In 1989, Robert Clark, Steve Bennett, and I co-authored South Carolina, The Natural Heritage, for the University of South Carolina Press. Bennett, from Thunderbolt, Georgia, knew Dickey’s wife, Deborah, who was also from Thunderbolt, and through this connection and $800 of USC Press money, Dickey agreed to write our foreword. And so I met the man at last, some 15 years after he spoke at the Longstreet Theatre. We sat side by side at book signings. We shared the Georgia connection. His mere presence encouraged me to write. He was my muse. We kept in touch over the phone and from time to time, on some pretense, I’d drive across town to his place. No longer were we strangers. I remember walking the shade-dappled sidewalks of Senate Street in 1990 when a festival, Mayfest, took place there, long before moving it to a public park killed it. Lost in thought, watching the sights, someone called my name. It was Dickey. Slowly I built up a local writing career. Small steps, but steps forward, and one step involved an ambitious stride toward Mississippi where a short-lived magazine, Reckon, Southern to the core, published features about writers. And so, on a humid Saturday, June 24, 1995, I interviewed a Dickey in decline for Reckon, soon to cease publication. At home, sitting in his wingback, on oxygen, fortified by stacks of books and wearing two watches, he answered me, telling me how language caught his ear. It started with his dad; he worked as an attorney. Many times, Eugene Dickey read speech transcripts by Clarence Darrow and Robert Ingersoll to his son, and across the decades one speech lived within James Dickey. He recited Ingersoll’s opening statement in defense of some Southerners accused of murder. In 1995, Dickey, thin as a reed, looked nothing like Sheriff Bullard. He had fears. Dickey, who had been exposed to the Nashville Agrarians, the Fugitives, feared the South was in danger of becoming one giant Rexall. Surely its last gasp was coming. The generic culture of superstores, malls, and cable television was eating the South he had known. I will go to my grave believing one thing about James Dickey. Had he used a computer he would have finished his sequel to Alnilam, Crux, and another novel for sure. I wrote 231 words in Reckon about Dickey’s drinking. I wrote that his drinking “led to overindulgence and damage.” Didn’t think twice about it. It seemed “writerly,” and I was impatient to get my hands on the Winter 2006 issue. Dickey got his first. His words stung me. The call ended badly. I gave him a wide berth for a while. I wasn’t sure what to say to him. The months rolled by and I struggled: what to do, what to say. A year passed. Somehow I knew I had to make amends. I recall an icy December night in 1989. Robert Clark and I went to Dickey’s home with twenty-seven copies of South Carolina, The Natural Heritage for Dickey to sign, Christmas gifts. Intending to drink with the man, Robert and I brought bourbon as a gift: Jack Daniels Single Barrel Whiskey I believe. I remember the bottle was pretty. We arrived on time. 7:30 p.m. Dickey met us at the door in his pajamas. He had no need to drink further. He took the bottle and placed it high on a shelf. Then after signing the books with his ornate signature, he asked us to join him in his study. There, to my disappointment, he asked if we were from the South. Dickey moved toward the hall. “Boys, I’m a busy man. I’m expecting a call from my agent any minute.” He showed us the door. In the space of 15 seconds Robert and I were out in the cold, a precarious stack of books in our arms, wondering, exactly, what had hit us. Wondering what happened to our night of drinking with the Deliverance poet. We pretty much knew what happened to the Jack Daniels. Dickey was laid to rest at All Saints Waccamaw Episcopal Church cemetery on Pawley’s Island, South Carolina, on a chilly sun-paled January day, everything blue, everything dead. One afternoon in 1997, a summer thunderstorm raging, a student and I drove to his home so she could say she had seen Dickey’s house. There was no home. Its location had been sold. Nothing remained but rubble and bulldozer tracks. We trekked through the rain and returned with three bricks. She kept one. The other two sit in my office. Alongside them is a smooth stone I picked up from shallow Chattooga waters, monuments you could say. That was twelve years ago. A new home sits at 4620 Lelia’s Court today, overlooking Lake Katherine. No marker, nothing, tells the passersby that the poet and author of Deliverance created literature and art here. What a shame. When it comes to James Dickey, there are regrets aplenty to go around—on all sides. Among them, a share belongs to me. I earned it when I yielded to the temptation to disparage a man just because it seemed stylish. The thing to do, as so many others had. And the truth shall set you free…..What a man…I too read the book before the movie came out, took me all of 3 days. I grew up wandering around North Georgia fishing trout streams and hiking the mountain trails. 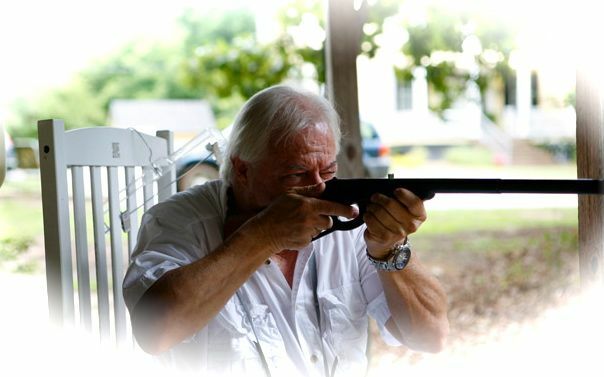 Thank God for the Boy Scouts, the State of Georgia and a Southern Baptist Preacher named John McGinnis who taught me to hunt and respect the land….